Hysterectomy can be performed during sacrocolpopexy, but there are limited studies comparing the effect of route of hysterectomy on adverse events. We hypothesized there would be no difference in adverse events or patient-reported outcomes in women who underwent minimally invasive sacrocolpopexy with either vaginal or supracervical hysterectomy. This was a retrospective chart review with a cross-sectional survey component sent to all consenting patients. Patients were identified by procedure code for sacrocolpopexy and hysterectomy from January 2005 to June 2016. Of the 161 subjects meeting the inclusion criteria, 116 underwent supracervical and 45 vaginal hysterectomy. Overall incidence of perioperative adverse events was low. Vaginal hysterectomy cases were faster (276 vs. 324 min, p < 0.001) and had higher rates of postoperative stress incontinence (22 vs. 9%, p = 0.03). Thirty-one (19%) of all subjects had recurrent prolapse; 10 (6%) underwent repeat surgery. Three (1%) subjects had a mesh exposure (no difference between groups), all treated conservatively. Ninety-six (60%) subjects responded to the survey with a median follow-up of 56 (9–134) months. Ninety-one percent (87) of respondents reported being better since surgery, and 91% (87) reported they would choose the surgery again. Twenty-eight percent (27) reported a surgery-related complication including pain, urinary and bowel symptoms; 8% (8) reported evaluation for recurrent prolapse symptoms, all treated conservatively; 4% (4) of respondents reported a mesh exposure. Incidence of adverse events is low and not different between patients undergoing minimally invasive sacrocolpopexy with concurrent supracervical or vaginal hysterectomy. One in three patients report pelvic floor symptoms postoperatively, but long-term satisfaction is high. 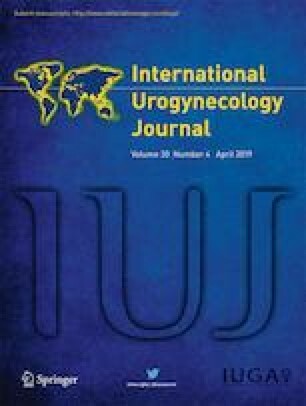 This paper was presented as a poster at the annual American Urogynecologic Society meeting in Providence, RI, in October 2017. The authors report no relevant conflicts of interest or disclosure for this work. Our full list of disclosures is listed below for full transparency. • Dr. Davidson is an independent consultant for the International Academy of Pelvic Surgery. • Dr. Thomas is an author for and receives royalties from UpToDate®. • Ms. Lampert has no conflicts of interest. • Dr. Paraiso is an author for and receives royalties from UpToDate® and has unrestricted research grants from Coloplast and Caldera. • Dr. Ferrando is an author for and receives royalties from UpToDate® and has unrestricted research grants from Coloplast and Caldera.